Yesterday I finally cast on the underarms and joined the front and back of my Old Harry for the Wayward KAL. It's going to be all stockinette in the round for a while, but I need to take a look at how much yarn I have. I think I might have to make this sweater fully cropped, hitting just below my natural waist, instead of the slight crop that's written in the pattern. Fortunately, I have a few high-waisted skirts that these colors will go great with, so I think a more cropped Old Harry will work great in my wardrobe. 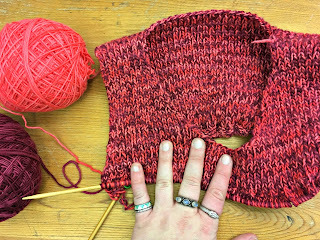 The KAL goes through February, so I think I'd like to finish the body by the end of the month so I'll have plenty of time to avoid working on the sleeves. This week I'm working on my social media involvement. I really love Twitter, and I'm only Facebook friends with people I care about and want to keep in touch with, and I've spent a lot of time curating my social media feeds so that I don't see much abuse or vitriol. But I have civically engaged friends (and I'm so glad I do, and I'm so thankful I have people in my life who care and are involved), and lately it's been hard to see some of the stories they've been sharing. The one that finally got to me was the furloughed government worker who can't afford insulin, which would be upsetting to me at the best of times, but I'm currently in the middle of trying to convince my insurance company to cover my blood sugar testing strips, and it's all a bit too much right now. I don't know what the right balance is going to be yet. Like I said, I love the friends and communities I'm in touch with on social media, and I don't want to miss out on any of that, but I definitely need to prioritize my own mental well-being right now. I scaled back on reading twitter (still read though). I came across a super upsetting post so I muted them. That made me feel better. Most times the news isn't much fun. Your sweater looks lovely and I hope you have enough yarn to do what you want to do.